Looking for an alternative to pasta? 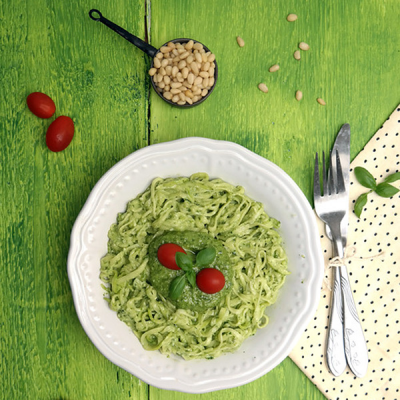 This raw dish is just as delicious as spaghetti! Mixed with macadamia and cedar nut pesto for a rich and cheesy treat. Toss all the ingredients except zucchini into a blender and pulse a few times until coarsely blended, occasionally stopping to scrape down the blender jar. Let it rest in the fridge. Spiralize the courgettes into spaghetti (in this case they resemble linguine rather than spaghetti), put them into a colander, add some salt and let them drain for about 20-30 minutes to remove excess liquid. After this, wrap them in kitchen paper and squeeze slightly to get rid of as much water as possible. Add pesto, mix well and serve immediately. This recipe was made in colaboration with wonderful La Tortoise blog.